Sufism and liberal philosophy are most respected in Kashmiri literature. 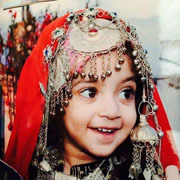 And Kashmiri children are named to reflect the unique heritage of this scenic region where pastoral and nomadic lives are common. Kashmiri families also consult a Muslim cleric and those well-versed in theologies before naming their children as they seek the blessings of all learned, wise people in the society. 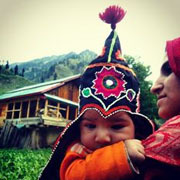 Many of the ceremonies associated with the birth of a Muslim child are common to the Kashmiri Pundits. Both the families visit shrines, seek the help of revered saints and observe fasts in order to be blessed with children. The pregnant wife in Muslim families goes to her parent’s house where she gives birth to the child. The mullah visits the family and taking the infant by the right ear, whispers the “Azan” welcoming the new arrival to this world of faith, and then he repeats in the left ear the “Takbir” and adds a warning that death is the end of all things. The young mother fasts for one or two days during which she takes only an infusion of certain herbs. On the seventh day which it known as the “sunder day”, the mother bathes and the child is given its name. The name is usually given according to the month in which the child is born. Thus a boy born in the month of Ramzan, Shaban or Rajab will most likely be called Ramzan, Shaban or Rajab. A boy born in the month in which a great saint died will be given that name. On the seventh day the barber is called in and he shaves the child's head, and the neighbours and relatives are entertained in the feast. Two or three months later the mother returns to her father-in-law's house carrying with her presents, among which may be a calf or a pony or a mare.